This page covers the product group for old mill sites and weirs. 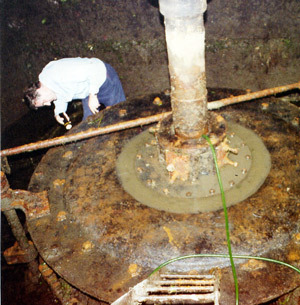 Illustrated above is a pair of 50 kW propeller turbines driving one 100kW alternator connected into the national grid in North Wales. 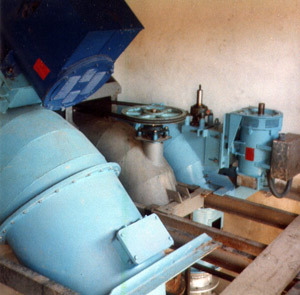 There are four turbines in total on this site and the working head is 6 metres. 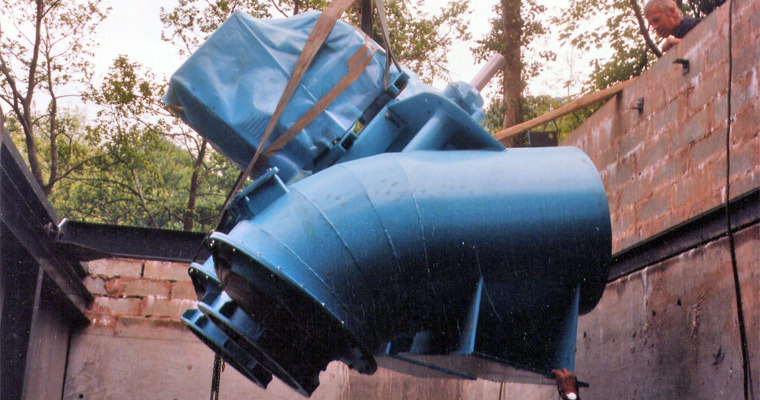 In the ‘Product Gallery’ below, I am showing a selection of turbines that we have designed and built over the years. Most of the designs have been improved and up-rated and include enhanced features such as cast stainless steel runners, brushless alternators and our electronic control and governing systems. 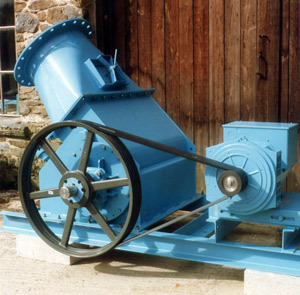 All have a 10-year guarantee and many have been operating continuously for over 30 years. The prices given are for guidance only, because for any one turbine size there may be a range of alternators and control systems to match the required electrical output. This is why I give a BBS (basic bare-shaft price). To this price is added the drive, alternator and control system, together with any items such as valves or screens. A basic system can be fully functional and as efficient as a more sophisticated unit, it is simply less convenient. Being modular, some of the enhanced options can be added at a later date if required. Illustrated is a turbine operating on 3 metres of fall that is providing up to 3 kW of single-phase electricity to a single house. The guide vanes are adjustable for matching the site and the runner is cast steel, and a brushless alternator as standard. Illustrated is a turbine operating on 4.5 metres of fall that is providing up to 45 kW of three-phase electricity to a Field Centre in the UK. It is double regulated with a cast stainless steel runner and a brushless alternator as standard. 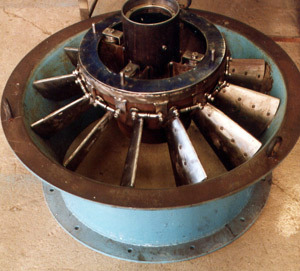 Illustrated is an old Francis turbine operating on 2 metres of fall that had an output of 50 kW. 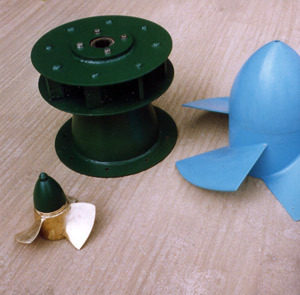 Such a turbine is suitable for complete renovation and the addition of ‘fish-screens’ or modification to ‘fish-friendly operation by the removal of most of the guide vanes and the replacement of the runner. 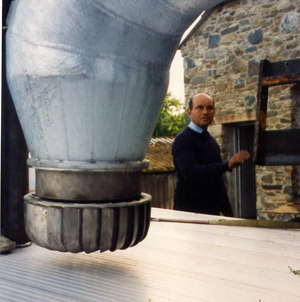 Illustrated is a turbine operating on 3.5 metres of fall that is providing up to 8 kW of single-phase electricity to a private house in Ireland. The updated version of what you see has a cast stainless steel runner and a brushless alternator as standard. Illustrated is a turbine operating on 6 metres of fall that is providing up to 50 kW of electricity three-phase for a farm in North Wales. The updated version of what you see has a cast stainless steel runner and a brushless alternator as standard. Illustrated is a turbine operating on 9 metres of fall that is providing up to 12 kW of single-phase electricity at 240 volts to an estate in Scotland. The version you see has a cast stainless steel runner and a brushless alternator as standard. Illustrated is a turbine operating on 3 metres of fall that is providing up to 15 kW of single-phase electricity at 240 volts to a Mill in Cornwall. This design is fully variable flow. 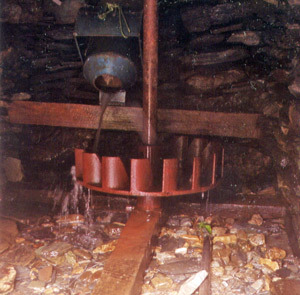 Illustrated is a very basic turbine operating on 3.5 metres of fall and provides up to 3 kW of single-phase electricity to a mill in Cornwall. 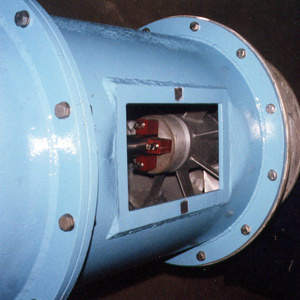 The turbine has full flow control and is manufactured in cast steel. Illustrated is a cross-flow turbine operating on 6 metres of fall, and provides up to 18 kW of single-phase electricity to a mill in Scotland. As with all our cross-flow turbines the runner is cast in stainless steel. 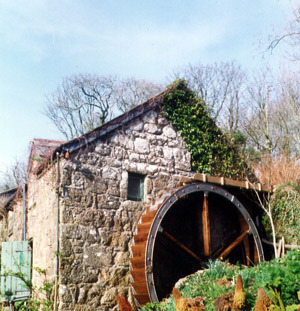 Traditional waterwheel that has been converted to generate electricity by the addition of an epicyclic gearbox, generator and electronic governing system. There appears to be more and more combinations and permutations every time I look at a new project. 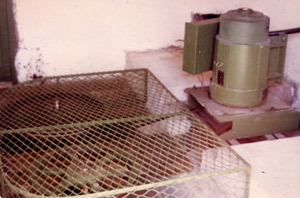 And low head sites are particularly difficult because in addition to the hydraulic considerations, the plants are physically larger, there are usually fishery issues to be addressed, and the aesthetic have to be in keeping with the mill because the owners usually live right next to the installation. This last factor is why ‘screw pumps’ are a less attractive option than a submerged ‘fish-friendly turbine’.